As an exercise in utmost silliness, Legion is a goofy success. God is once again fed-up with humanity, and in the divine version of hitting the alt-ctrl-del combo, rather than a flood he unleashes hordes of zombiefied angels to wipe the slate clean. 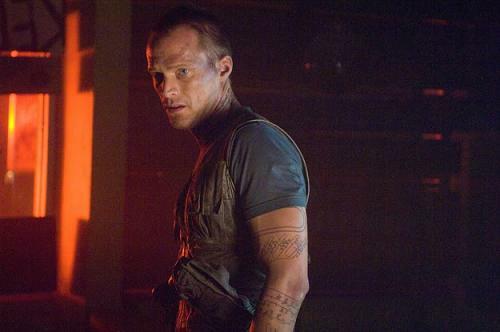 Disobeying God's orders to obliterate all-things human, the archangel Michael (Paul Bettany) still believes that human beings as a species are worth saving. He swoops down to earth, cuts off his wings, steals an arsenal's worth of heavy weapons, and races to the grimy, middle-of-nowhere Paradise Falls diner in the Mojave Desert. The diner's scruffy owner is Dennis Quaid, and the typical assortment of lost tourists and significantly more lost souls have stumbled into his booths. The local waitress (Adrianne Palicki) is very pregnant, the father of the unborn child is unknown (hmm...), and apparently this baby, if allowed to live, will be the savior of humanity. Naturally, the diner is soon the focus of attacks by the killer-angel-zombies, and Michael enlists the assorted characters stranded at Paradise Falls to fight them off, generally by mowing them down with heavy machine guns from the rooftop. Realizing that he needs more firepower on his side, God sends the archangel Gabriel (Kevin Durand) to overcome the resistance of Michael and his ragtag team, leading to a final confrontation between the angels, but also allowing man to symbolically rediscover his role and perhaps earn another chance at living. If it all sounds on the far side of ridiculous, it is, and it's also reasonably exciting. Borrowing heavily from sources such as Terminator and Tremors, director Scott Stewart, working with screenwriter Peter Schink, makes the right call in playing Legion mostly straight. Although some of the angel-demons are scary-funny, in general Legion avoids irony, sarcastic winks at the audience, and the stream of witty comments and hip attitudes that could have plagued the film. We are simply plonked into an imaginative supernatural and apocalyptic alternate reality that happens to be unfolding in the desert, and Legion pretends to be nothing more. It isn't, and the stripped-down, straightforward approach works.